This year’s Winterfest kickoff will occur on November 12th! Join us for the 3rd Annual Salute to Veterans Parade as we pay tribute to the men and women who have served in America’s Armed Forces. Other activities include a kids’ play area, food vendors, pictures with Santa and Mrs. Claus, and musical entertainment. The traditional lighting of more than five million lights on the Winterfest displays, followed by fireworks, will top off the evening. 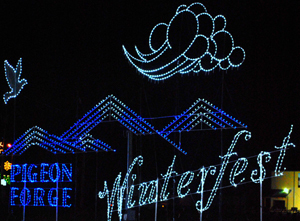 The parade will wrap up around 5 p.m. and the festivities for the Pigeon Forge Winterfest kickoff will begin! Activities include a kids’ play area sponsored by East Tennessee Children’s Hospital, food vendors, pictures with Santa and Mrs. Claus, and musical entertainment. The traditional lighting of more than five million lights on the Winterfest displays, followed by fireworks, will top off the evening.